The OCSMP program consists of four levels, arranged in a single hierarchy. The first level, OCSMP Model User, covers a wide range of essential MBSE and SysML knowledge and skills and so enhances the resumé of those who contribute to a model-based systems engineering project. Building on this foundation are three levels targeted at model builders and advanced model users. These levels, termed OCSMP Model Builder - Fundamental, Intermediate, and Advanced, cover their topics with an emphasis on the interconnectedness among the different model viewpoints that gives MBSE its advantage over conventional engineering methods. Lower-level certifications are prerequisites for levels above. The Subject Matter Experts who developed the OCSMP topical coverage and wrote the questions for the examinations are contributors representing large and small Systems Engineering contractors and end-users, SysML tool vendors, training providers, and more. This distinguished group has expertise in every aspect of Model-Based Systems Engineering and SysML. The OCSMP Model User examination tests the candidate's ability to interpret and understand SysML models, covering fundamental concepts and elements of all nine SysML diagram types plus a set of additional concepts that cut across diagram types. Using the knowledge and skills covered at this level, a holder of the OCSMP Model User Certification can be a productive member of a Systems Development team employing a model-based systems engineering approach using SysML. This certification is useful and appropriate for many different roles in a system engineering project, such as an engineer on the system design team contributing his or her domain knowledge to the systems modeling effort; a software developer, hardware designer, or test engineer using the system model as a source of requirements; an engineering analyst using the system model as a baseline for his or her analyses; or customers, managers, and others involved in the development effort who use the model to maintain a shared understanding of the system. The OCSMP Model User Certification is a prerequisite for the three Model Builder levels of OCSMP certification, which extend coverage to the knowledge and skills needed to build SysML models and employ them in the practice of model-based systems engineering. The OCSMP Model Builder - Fundamental examination tests knowledge and skills required to construct a basic SysML model of a system. Coverage starts with model concepts and organization, and the purposes and benefits of modeling a system, and extends to basic requirements capture and management, structure and behavior models, parametric models, allocation relationships, and use of stereotypes. Language coverage is restricted to the basic SysML feature set listed on the OCSMP Model User certification Coverage Map. Using the knowledge and skills covered at this level plus familiarity with a suitable SysML modeling tool, a holder of the OCSMP Model Builder - Fundamental Certification should be a productive contributor to modeling tasks performed by a Systems Engineering team employing a model-based systems engineering approach using SysML. This certification is also appropriate for other roles on a development team such as those involved with configuration or requirements management, or those using the model to support their analysis. This could also include a reliability engineer who may want to query the model for how reliability requirements are addressed, or a quality test engineer who may want to extend the model to define test strategies or cases. The OCSMP Model Builder - Fundamental Certification is a prerequisite for the program's two higher levels, and requires the OCSMP Model User Certification as its prerequisite. The OCSMP Model Builder - Advanced examination tests the knowledge and skills used to establish and support a systems modeling culture and environment, leveraging the capabilities of SysML and MBSE across the organization. High level topic areas include: (1) Concepts for adapting SysML including metamodeling, profiles, model libraries, and viewpoints; (2) Approaches to integrating SysML with other modeling languages such as UML, MARTE, UPDMTM, and Modelica; (3) Approaches to integrating SysML modeling tools with other types of engineering tools such as requirements management tools and configuration management tools; and (4) Methodology-related concepts and practices including assessment of the quality of the model. With the knowledge and skills covered at this level, plus suitable experience in modeling, methods, tools, management, and leadership, a holder of the OCSMP Model Builder - Advanced certification can play a leading role in establishing SysML-based MBSE at an enterprise, or extending its penetration into new departments or product areas; the individual could also define and establish new projects and support them through their lifecycle. 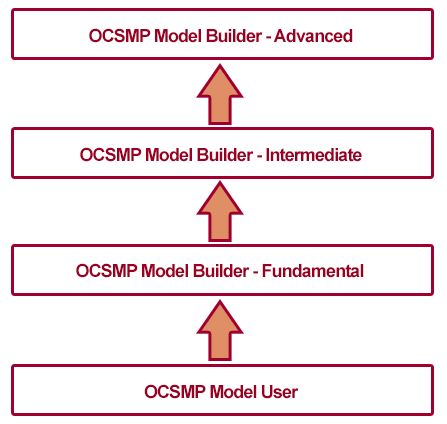 The OCSMP Model Builder - Advanced certification requires the OCSMP Model Builder - Intermediate certification as its prerequisite.